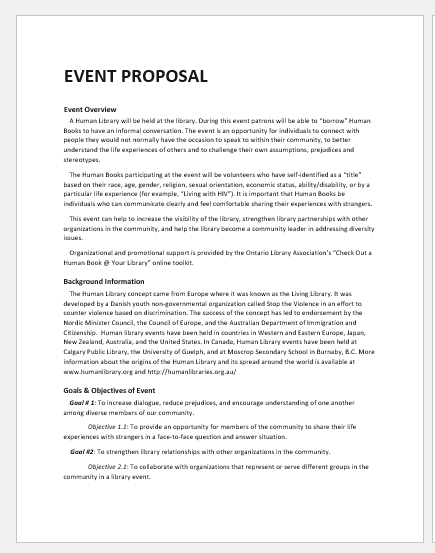 What is an event organization proposal? This document is used by event organizers when they want to offer their services to individuals or companies. People need to hire event organizers if they want their event to be successful. There are lots of things involved in the organization of an event that make it extremely complex. The event organizers work for simplifying the process of event organization with their expertise in this area. The event organization proposal prepared for the client reflects your professionalism as well as your skills. Writing an event proposal is not the only thing to be done when it comes to offering your services. Another important thing is to tailor your event in such a way that it can fit the needs of your client. The proposal that you represent should be personal. Before you start writing the proposal, it is recommended that you meet your prospective clients in person and ask them about the type of organization that they have in their mind. You should know what the company is hoping to achieve and what their goals are. All the details such as location, venue, menu, decoration etc. should be discussed in detail. How to write the event organization proposal? The proposal should always be started with the introduction of the person sending the proposal. It is also important to introduce the business in the proposal. The professional background of the company is the main information in which the people are usually interested. Many people forget to add the introduction to the proposal or some also add it at the end which is not a professional approach. It should always be kept in mind that the proposal without the introduction of the recipient is incomplete and has no value. What you already know about the event is important to be mentioned in the proposal. If you have had several meetings with the company and you have got plenty of information regarding the event, it is recommended to write them in the proposal in a summarized way. Time frame, the total number of guests and lots of other details are added to this section of the proposal. Make sure that you write the description in a catchy way so that the reader feels it interesting. This part of the proposal is what the reader is concerned about. The client may want to know what services provide to your clients. You should mention the services in the proposal with bullet points. If you are offering the services for a small event, the services can be written with bullet points. However, if you are writing the proposal for a large business, writing the description of each service by dividing the proposal into different sections is recommended. If you are a professional event organizer who has worked for many organizations before, you can show your sample work to your client so that they can get a clear idea about how you will work for them.